The State Department of Environmental Quality issued the dates when open burning is possible this year. They have also reminded us of the regulations which require completion and approval of an on-line permit application for anyone wanting to open-burn for any reason. Open burning is considered daily by the DEQ and is allowed only if the “Clearing Index” is high enough to allow it. Completed and approved permits must be on-site with the responsible person at the location of the open burn. Open Burn Season-Permits may be issued between March 30 and May 30 and between September 15 and October 30. 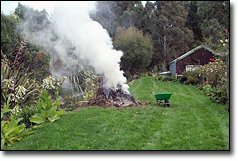 This rule allows open burning of clippings, bushes, plants, and prunings from trees incident to property and residential clean-up activities. No trash, rubbish, tires, or oil are included in the material to be burned, used to start fires, or used to keep fires burning. Click here for open burn application. Click here for the DEQ (Dept. of Environmental Quality) website.